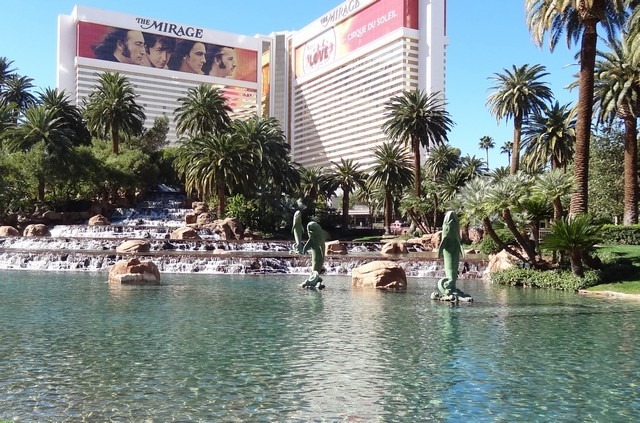 Just Wanderin': Las Vegas – We have arrived ! Las Vegas – We have arrived ! Finally we were on the road south. We didn’t plan on having long travel days. On top of that we didn’t have reservations until the 26th of October so we needed to drag our feet, err our wheels. We just knew we had to get south of Roseburg, Oregon since that seemed to be the “rain” line. We had a small window to beat all that rain and the window opened at the perfect time. Our plan was to head towards Klamath Falls, Oregon. We didn’t make it. Instead we continued on to Canyonville which is just a tad south of Roseburg. We pulled into the Seven Feathers Casino RV Park about 3:00 and had a great pull-thru site. The RV sites aren’t necessarily cheap but they sure were nice. On top of pulling into a nice site, we didn’t need to disconnect. All we did was plug into electricity and set up our new Dish Playmaker so we could watch the debates. Now how easy was that? Pretty easy to be sure. We had tried out the Dish Playmaker with the Wally receiver before we took off. We even purchased a drive so we could record in advance some of the shows to watch on the road. If we were going to do a review on it, we would say it worked perfectly. Thursday morning we were on the road again. This time we set the GPS for about 280 miles and another Casino RV park in Corning, California. The farther south we went, the bluer the sky seemed to be. By the time we rolled down the last mountainous hill into Redding, it was warm and the sun was shining. Woot! Woot! Our destination for the day was the Rolling Hills Casino in Corning, California. We had stayed here several times in the past and it’s another perfect spot along I-5. They not only have a great RV park they also offer a 50% discount on Thursdays for their buffet. By now I realized it was definitely time to think about changing out some of the heavier clothing for some of our lighter clothing. Instead of running the heater, windows were opened to cool us down and let the fresh air flow. We didn’t quite need the air conditioner yet. Friday we were on to another RV park we had stopped at before. Santa Nella is home to the ever so popular Pea Soup Andersen’s. Ever stop there? We hadn’t but had seen all the signs along the freeway in the past so figured this would be lunch and dinner. Over the past few nights we’d taken a few walks in the evening and been able to “walk” to dinner. This time it was too far so stopped before we headed to the RV park down the road. We were lucky that we were still early as we snagged the only site they had left. It was a double site and by pulling into it a little crooked, no unhooking was necessary. Saturday was another day on the road only a little longer this time. We stopped at the Murray Family Farms which is east of Bakersfield. If you’ve ever slid down the Tehachapi pass, you’ve seen this place. We usually make a stop here. It’s a great place to stretch your legs. This time the place was packed with kids. We were just in time for their annual Halloween event. Barstow was our next stop. It was also our last night on the road. We'd been lucky in that we had found pull-thru stops and not had to unhook once. We found it necessary to turn that air conditioner on. It was quite warm so we even waited until evening before we took our walk. We’re in Las Vegas now but we have no idea for how long or where to after that. We have lots of ideas but very few plans. We did get our reservations moved forward a couple days so didn't have to worry about moving from one RV site to another ---- at least for 10 days. We’re happy with that but will we really stay 10 days? We don’t know. Monday we thought we'd visit the Strip …. again. Maybe we’d even try another one of Gordon Ramsey’s restaurants. However, we may have to rethink our plans. It's raining!! Yes, it's RAINING!!! We thought we'd left those rain clouds behind. Do you think it followed us? Since the "roadhouse" was new we've found a few things we need to work out on it. The windows don't slide open very easily yet. You could swear the door is locked because it's been hard to open. WD-40 is a necessity. We replaced the mattress with a memory foam one but now desperately need day and night shades. That's next. A ladder would be helpful because our Dish Playmaker occasionally may need to be placed on top of the "roadhouse" when we're parked next to some other RVs. That's next too. We need racks and hooks and other gadgets ... but it's little and it's lite. Overall, it's been perfect for the trip south and it'll be perfect for our short travels. However, I must admit I'm a little anxious to get back to the motorhome we left in Arizona. yep, I gave up on the blogging. At least in Vegas you know the rain won't last forever! Hey we know that route. Happy for you to be back on the road. Okay - if you're bringing rain please come on down. We sure could use some. Have fun in Vegas. Nice blog catch up. Looks like you are making pretty good time, keep going until there is no more rain. Dang! You weren't supposed to catch up to more rain. Maybe you traveled a bit too fast? Jere.....we removed our daynight shades and replaced them with room blackout shades from Home Depot. The honey comb type. WE LOVE THEM!!!! They are a fraction of the cost of RV shades and do a fabulous job. So easy to use, easy to install, look beautiful, and inexpensive. Home Depot cut them to size too! Check'em out! I have never heard of anyone using a Dish Playmaker. Sounds like a great choice. Enjoy LV. The "road house" sounds perfect! Great choice. Enjoy your Las Vegas time!